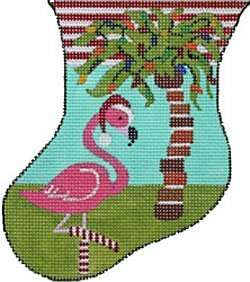 A handpainted needlepoint mini stocking called Flamingo with Palm Tree by KAMALA depicts a flamingo in striped stockings and Santa hat. It is offered by Julie Mar and Friends designs. The design area measures 5" x 3.5" and is handpainted onto 18 mesh mono canvas. Use the drop-down menu to select fibers if you need them. If you select cotton we will send DMC cotton floss. For wool we will send Bella Lusso, and silk we use Planet Earth Pepperpot boutique fibers which are single-ply for 18 mesh and easy to stitch with. If you require stretcher bars we recommend a pair of 9" and a pair of 7" and some thumb tacks.